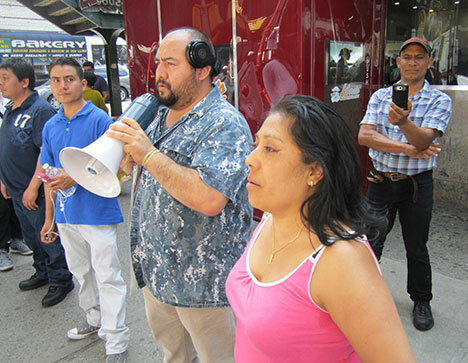 Laundry Workers Center co-director and leader of Hot and Crusty workers Mahoma Lopez (with bullhorn) and Liberato restaurant workers leader Maggie Andrés Crecencio at June 22 protest. JUNE 22 – “Liberato Workers, We Are with You” chanted the crowd of over 70 protesters outside the Liberato Restaurant on Jerome Avenue in the Bronx. Also, “Against exploitation – organization,” “La lucha obrera no tiene fronteras” and “Asian, Latin, Black and White – Workers of the World, Unite!” Demonstrators had come out for an emergency rally in response to the June 20 firing of three of the immigrant workers leading the bitter fight that has lasted over a year already against wage theft and sexual harassment. The blatantly retaliatory firings were the Liberato owners’ revenge for workers’ refusal to accept an insulting “settlement offer” that, among other things, would have required those involved in the campaign to leave the restaurant. The firings came after Liberato, which operates two large North Bronx eateries, suffered legal setbacks in its attempts to stop the workers’ campaign. On May 8, state judge Eileen Rakower ruled against Liberato’s lawsuit charging labor rights organizers from the Laundry Workers Center (LWC) with “defamation” for telling the truth about conditions at the restaurant. Dismissing Liberato’s suit, she stated that it had “‘all the earmarks’ of a strategic lawsuit against public participation, or SLAPP, suit”. SLAPP suits are intended to intimidate critics by burdening them with onerous legal procedures. A month later, LWC activists sued the company for legal fees incurred in defending themselves against the suit. Intent on using every dirty trick in the bosses’ arsenal, Liberato also filed a federal “RICO” suit against the LWC early this year, using the Racketeer Influenced and Corrupt Organizations Act, notorious as a tool for “fishing expeditions” and bankrupting its targets. Employers have often “used RICO to try and intimidate workers and worker organizations, and ... they can cause reputational damage at least,” notes Fordham Law professor James Brudney, as such suits can bring not only treble damages but smearing labor organizers as “mobsters” (Village Voice, March 10). As those who have followed the Liberato struggle can attest, the real gangsterish tactics are those used by the bosses in their attempts to silence the workers. 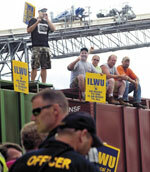 June 22 protest in defense of fired Liberato workers. At the City University of New York, the Internationalist Clubs and CSEW have rallied support for the Liberato workers’ fight. This has included bringing contingents of students and adjunct professors to the picket lines, arranging for Liberato workers to address campus speak-outs against racist police terror, and organizing a special “Solidarity with Immigrant Workers” meeting to support the Liberato struggle outside Hunter College on April 21.